You'll be £25.00 closer to your next £10.00 credit when you purchase Waterloo Messenger. What's this? Order within the next 8 minutes to get your order processed the next working day! Henry Percy is best known as the officer who carried the Waterloo Dispatch, the Duke of Wellingtons account of the Battle of Waterloo and the ultimate defeat of Napoleon, to London in June 1815. This was the climax of a remarkable military career. He served in the British army throughout the Napoleonic Wars in Sicily, Egypt, Sweden, Portugal and Spain, and he fought at Waterloo. This biography gives us a fascinating insight into active service and the high command during those wartime years. The strong, contrasting personalities of the notable British and French commanders he encountered Moore, Wellington and Junot among them are revealed, and his time as a captive in France offers us a rare inside view of the everyday existence of a prominent prisoner of war. Using archives in England, in particular at Alnwick Castle, and in France, William Mahon has reconstructed Percys life in meticulous detail. He paints a vivid picture of Percys wartime experience. He also describes his enduring friendships and his liaison with the French woman who bore him a son. This biography tells the story of a brilliant officer of the British army who spent several years in France as a prisoner of war. Although a slim volume this book packs a punch as an intriguing tale related to Waterloo and the author can be congratulated for his thorough research and turning it in to a very coherent and interesting story. 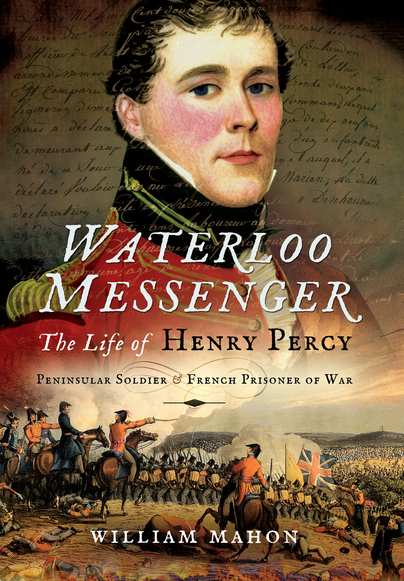 Although the author states that this is not a true biography of Henry Percy due to little surviving contemporary sources, "Waterloo Messenger" is nonetheless an excellent account of the life and times of this officer who served as an aide-de-camp to Sir John Moore, as a part of the Duke of Wellington's military family and the man who carries the "Waterloo Dispatch" back to London. The research is thorough and detailed, bringing to light the events surrounding the death in action of Moore in Spain, the various goings-on at both the French and British higher headquarters and Percy's time as a prisoner of war in the hands of the French. This is an informative and welcome addition to the vast amount of literature on the Napoleonic Era. A book more for the general reader than the specialist. Having said that the are some interesting insights into staff work. Also the description of how some prisoners of the French were treated is an eye opener. The book is not a biography but uses the life of Henry Percy as the thread running through some of Moore's and Wellington's campaigns in the Peninsula. That having been said I suspect, largely on the grounds of the author's extensive researches, that there is little more evidence available on Henry Percy's life. All in all a good read which doesn't quite give all the title promises. Colonel Mahon has written a witty,thoroughly researched book which is easy to read and full of fascinating anecdotes [the 22 pages of Notes are full of surprises and coincidences ]. The story of Sir John Moore's sword and Henry Percy's captivity,love affair whilst on parole and subsequent children are just two of many nuggets unearthed. That Wellington entrusted the Waterloo Despatch to Percy comes as no surprise and one is left with an impression of a remarkable and eventful man who deserved more recognition.He now has got it. Thoroughly recommended as a study of the life of officer in Wellington’s army, plus the additional details of his time as a prisoner of war. Colonel Sir William Mahon served in the Irish Guards and in Germany, Malaysia, Aden, Hong Kong, Pakistan and Spain. He is also a former officer of Her Majestys Bodyguard of the Honourable Corps of Gentlemen at Arms. Having visited Waterloo many times, his boyhood interest in the Peninsular and Waterloo campaigns was rejuvenated by his attach service in Spain. The link between Corunna, Talavera and Waterloo focused in the curious story, full of coincidences, of one largely forgotten young officer, Henry Percy.